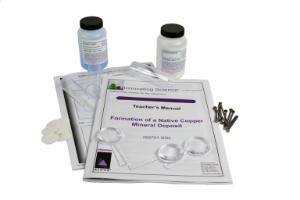 Form Native Copper Deposits right in the Classroom! Of all the naturally occurring metals copper is one of the most useful and versatile. Evidence suggests copper has been used by humans for at least 10,000 years. Copper is used for architecture. It is used for electrical wiring, water pipes, and plumbing fixtures. It is found in automobiles and a variety of electronics and electronic devices. It is in electrical motors, generators, and turbines. It is an important part of heat exchangers found in refrigeration and air conditioning units, it is on circuit boards and in electromagnets. While copper is typically extracted from copper-containing mineral ores that must be treated and refined to obtain the pure metal, copper also exists in nature in its native elemental form. This is the rarest and most valuable form of copper as it is the easiest to process to obtain pure metal. In this activity, students will create specific environment conditions and examine the formation of native copper deposits over several days. Aligned to NGSS Standards PS1A, PS1B, ESS3A; MS-PS1-2, MS-ESS3-1, HS-PS1-6; Structure and Function, Influence on Engineering, Technology and Science on Society and the Natural World, Patterns.